Ladies and gentlemen, boys and girls #Podgressive EP034 has landed! 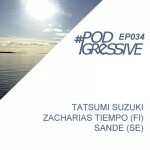 This months #Podgressive EP034 will be started by a great talent from Finland. His name is Zacharias Tiempo and has a good ear for house music. We have been supporting the local talents Sande & Acler and their collaboration. Their tunes are really good so why not to have a mix from Sande. He will be closing this podcast with some great energic sounds.The show is as usual hosted by Tatsumi Suzuki and he has been scrumed through a large bunch of releases to get his set done! So, head over to #Podgressive.com and enjoy the ride! DON’T FORGET TO GIVE YOUR SUPPORT BY WRITING A COMMENT, SHARE AND LIKE THIS EPISODE.